Wilson Brown is a creative director, composer and multimedia artist. He is the Executive Creative Director and Partner at Antfood, a creative audio studio based in New York, Amsterdam and São Paulo. They create original music and sound design for visual and experiential media. After receiving a B.A. and M.A. 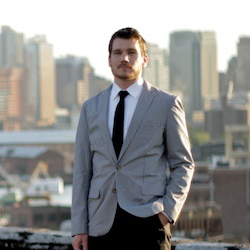 from Brown University, Wilson Brown has worked creating music, sounds and media in São Paulo and New York. He was awarded the Art Directors Club's "Young Guns 9", First Boards' Composer of the Year, and has worked on projects honored at Cannes, SXSW, Sundance, AICP, The Oscars, the Emmys and the Grammys. Antfood has worked on ground-breaking campaigns for Google, Apple, Emirates, PepsiCo as well as non-profits such as Goodbooks, Care, the UN and Michelle Obama's "Drink Up" initiative. When did you start composing and what path has your career taken to get you where you are today? For a long and dull history — as a kid, I started out learning piano and writing songs and simple lyrics, then later learned a little violin, guitar, trombone and many other instruments. I made cassette tape mashups off of late 80s Philadelphia R&B/Rap radio stations, and eventually got into analog 4-tracks, digital multi-tracks and eventually DAWs. In middle school and high school, I played in a handful of bands. We self-produced and released first tapes, then CDs, and eventually .mp3s. I came of age as both the record industry and music production tools were going through massive transformations. I studied traditional music theory and composition in college, and got a graduate degree in more Avant Garde computer music and multimedia. I then moved to Brazil with no money, and a dream to find a job in music, video or animation — or to fall back on teaching English if all else failed. I was lucky enough to get a staff writing position with Apollo Nove and Julia Petit at Ludwig Van, and then subsequently worked in a few other music houses over the following years. I moved to New York and was looking for an in-house composer position. This was in 2007, when Macintosh, Logic 7 + Waves (! ), and affordable Apogee, and similar interfaces, both lowered the barrier to entry and production budgets along with them. Many big music houses had laid off most of their staff composers, starting the shift towards subcontracted, freelance writers. So many of my would-be bosses, said, "we can't hire you, but if you set up your own project studio, we'll send some opportunities your way." So I found a place in Williamsburg, Brooklyn, and built a makeshift studio with my friend. Eventually I teamed up with Polly Hall, a friend from grad school, who was in New York pursuing similar goals. Within a year we were writing for 15 or so of the biggest companies in the US and had won some decent jobs. Very slowly our friends and contacts started to come directly to Antfood for small and weird motion graphics projects, and we began to build a reputation, a portfolio and an ethos. I mention this whole back story mainly to illustrate two important points about Antfood. One, we built a physical studio with an amazing team, classic and varied instruments and top-shelf gear to make the best work possible, as a team. Two, I came of age socially and professionally in this era of upheaval and change. Antfood wouldn't have been possible without great advances in digital technology, but we've made a concerted effort to preserve and honor the great traditions and equipment from the past, all while inventing new techniques and tools that are only possible today. Both technically and conceptually we try to blend the timeless aspects of composition and production, the best of old and new, and do things authentically for the style — It sometimes feels like we're luddites opting for the more difficult path, but for the time being, we're still here! It would be great to hear a bit about Antfood and your role there. How do you guys ensure that you stand out from the crowd? My title is Executive Creative Director, but as a partner and founder I end up wearing a lot of hats. I compose, record produce music for our projects, but more importantly, I run the creative department and try to give our composers and sound designers the tools, information and mentorship they need to make great work and improve in their craft. I spend a lot of time talking to clients, whether that is pitching new ideas or collaborating to make good ideas better. It varies greatly. We try to engage in projects where we have relationships built upon mutual respect. Sometimes clients come to us with a brief or specific idea and sometimes they come with a blank slate and ask us to propose some concepts. We start with pitching some ideas, that could be diving right into original composition, or proposing some of our prior work or other references. We keep a very open line of communication with clients and all stakeholders in a project and then get into composing, recording, producing, and refining the work until it's working in all ways that it should. Have you noticed any shift in trends in terms of what type of music is being sought? The industry shifted dramatically in recent years, looking back it is easy to put the pieces together of how we got here from the RIAA v. Napster days. But we will likely see even more drastic changes moving forward as performance royalties are overhauled, and media completes the shift away from "traditional broadcast" — where a significant share of synch revenue, residuals and royalties still reside. Over the past two decades, the availability of stock music and labels & publishers back catalogs and production music has made licensing existing music easier and in many cases less expensive. So many applications that used to require original music can be handled by licensing existing masters. Also, due to advertising's obsession with licensing popular music or "breaking" up-and-coming artists, a secondary market of sorts has sprung up to accommodate a variety of price points. Many media and content creators simply can't afford to license the biggest artists, so labels, publishers, libraries and independent music creators will create the B-movie versions at lower price points. The recording industry has been operating this way since the dawn of recording technology (with more egregious offenses in the early days). We pride ourselves on creating novel, original work that draws on the canon of popular music, but hopefully explores some new and interesting areas — but there is certainly a trend for safe, comfortable, whatever the kids are listening to. At Antfood, we have our hands in many pots in terms of composition style and application, but we try to do our thing, do it well and hope more work comes in! That said, popular styles of the moment are always in, currently (at least in the states) you can see that in big tech advertising with catchy, minimal beats and a vocal hook. We also see modern updates on late 20th century American composers (Reich, Riley, Glass) are popular and we're always a fan of astral, psych rap, when appropriate. Have you worked on any projects recently that you’ve been particularly excited about? And any especially tricky projects you can pinpoint? Yes, there are so many exciting things in the works including a project to compose and manipulate music with an EEG (using your brainwaves), a mobile game that we hope raises the bar for mobile game scores, and some large scale permanent installation work. One internal, creative project that we hope to complete is a Unity experience that explores interactive composition in 3D. The hope is to bring aleatoric modern composition into this space that falls somewhere in the middle of Terry Riley's "In C", Lucas Zanotto's "YATATOY" and Giorgio Moroder, or something synthy and psychedelic. As for tricky — I find that even (or especially) when challenging, making music is the magical part. Production is tricky, getting fairly compensated is tricky, and getting multiple clients/stakeholders with different tastes, reference and vantage points to agree on one musical direction is tricky, but possible. What does the near future hold for Antfood? We recently opened an Antfood studio in Amsterdam, so we're hoping to get that off the ground and better serve European clients. We're also developing some new initiatives in NY that are tech (new musical interfaces and playback systems) and new media (better production pipeline for unity-based AR/VR projects). Finally, we're working to re-launch our sister company, Better Problems, a licensing platform that weds human creativity, composition and production with some useful machine learning for media, content and advertising clients. And last but not least, your studio is on fire – what do you grab first?! The Neve console is too large, our session files are in the cloud, so probably my 1967 Princeton Reverb or hand-built ARP and Buchla clones.